We’d love your help. Let us know what’s wrong with this preview of The View From Here by The Walnut Creek Writers Guild. The View From Here is an anthology of nine original stories by The Walnut Creek Writers Guild. Beginning its fourth year, The Walnut Creek Writers Guild is an eclectic and dedicated group of writers producing works of fiction in every genre, as well as essays, memoir and poetry. THE VIEW FROM HERE was a project we undertook as an experiment to see what the results might be The View From Here is an anthology of nine original stories by The Walnut Creek Writers Guild. Beginning its fourth year, The Walnut Creek Writers Guild is an eclectic and dedicated group of writers producing works of fiction in every genre, as well as essays, memoir and poetry. THE VIEW FROM HERE was a project we undertook as an experiment to see what the results might be if we all wrote a piece based on a common theme. How many of you like to write? Well THE WALNUT CREEK WRITERS GUILD loves to write, and after writing very different pieces, we decided to each write a story around a single theme "The View From Here." I hope you'll read out book and enjoy the stories, and possibly go on to write your own "View From Here," story. If you do, I'd love to read it. This is a lovely collection of stories by a talented group of local authors in Northern California. The stories range from grotesque horror to an essay on what makes travel valuable to bellybuttons. 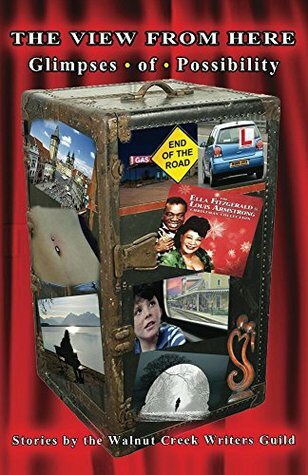 The range in The View from Here is wide and thoroughly entertaining, including both fiction and non-fiction material. I especially liked the essay by a visiting nurse on cleaning bellybuttons.